Bulldog Folding Trailers USA introduces a unique new product to help outdoor enthusiasts maximize their fun – a sturdy, road-worthy trailer that can carry a variety of gear from home to the outdoors and folds up to stow in a space smaller than a broom closet. Bulldog Folding Trailers are also available now to consumers via www.bulldogfoldingtrailers.com at a range of $1,290 – $2,958 for the various configurations. Additional accessories and parts are available via the web site. Seeking a solution to meet his own outdoor needs, Jeff Drugmand discovered the fold-up trailers on the Internet. “I needed a compact solution to transport my fully-rigged fishing kayak from the campground to the ocean,” says Drugmand, a lifelong outdoor enthusiast. Drugmand quickly realized how many fellow adventurers need to carry more than a carful of gear but were limited the storage space previously needed for such a vehicle. He became the U.S. distributor for Bulldog Folding Trailers in April of this year. The trailers weigh 132 lbs. and can carry up to 850 lbs. Certified by the National Association of Trailer Manufacturers, the trailers meet its stringent guidelines – a compilation of federal safety standards and industry best practices. Bulldog Folding Trailers was founded in Australia when Paul and Peggy Crane purchased the intellectual property for the first folding trailer. Initially developed for boats, the Cranes soon recognized the trailers could be customized to carry a variety of items in many configurations. JJ Outdoor Enterprises (dba Bulldog Folding Trailers USA) is headquartered in Erie, Colorado. The company is a subsidiary of Boulder Creek Outdoors, which carries a variety additional of outdoor gear, including the Kamplite Rooftop Tent, specifically engineered to meet the high standards of dedicated outdoors people. The pontoon trailer shown above on this web page is just what I am looking for as I own a 13′ inflatable pontoon boat and have been looking for a folding trailer like this for a couple of years. My research consistently brings me back to Bulldog. I am glad to here potential buyers in the US may now have a place to go for this great product. 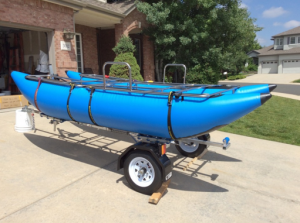 Please let me know what I can do to connect with you on reviewing the specifications for the inflatable pontoon boat folding trailer and a potential purchase. Thank in advance for any assistance you can provide. A Colorado Customer in waiting. I believe I purchased the last one available a few years ago. At that time there was a change in distributor and I have not heard if the new distributor ever materialized. I’m looking but I have not been able to find them. Too bad because it is/was a great product. Richard, I think I was the last bulldog trailer purchaser from the original distributor which occurred two years ago. There was supposed to be a change in distributor, but I don’t know if that ever occurred. I’m no seeing where anyone has stepped up to continue distribution of this awesome product.